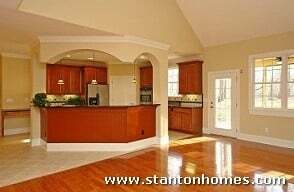 Popular locations for custom home archways include: formal dining rooms, foyers, family rooms, breakfast rooms, kitchens, great rooms, hallways, and master bathrooms. 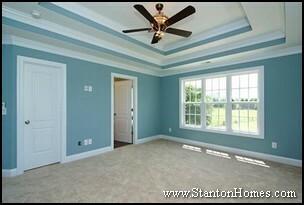 The placement, angle, and color of archways can be designed to create dramatic flare or discrete elegance. See photos of custom homes with archways in this Houzz Ideabook. *Not all styles available in all homes. 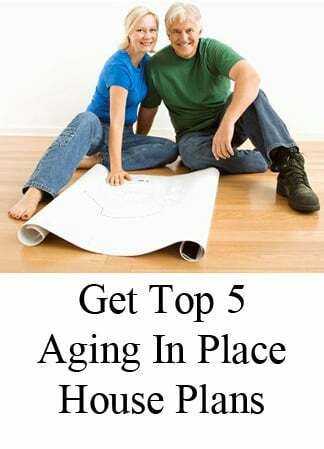 Styles available are dependent on floor plan, ceiling structure, and ceiling height. 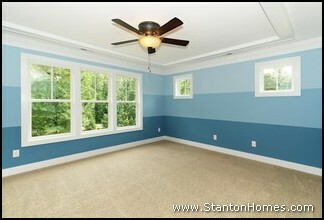 What Front Door Colors do Homebuyers Choose? 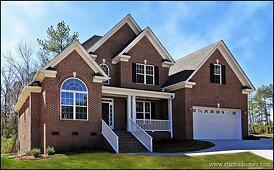 Red front doors seem to be growing in popularity among new homebuyers. 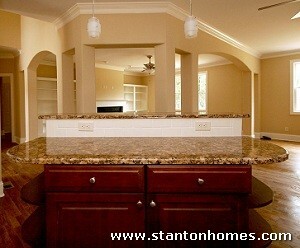 Whether they choose a bright tone or a dark shade, red is the common factor in the custom homes below. 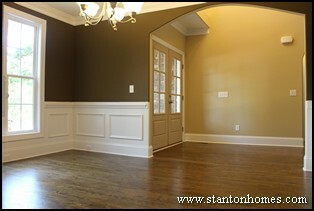 Other common colors include white, black, and shades of brown (using both stain and paint). Pictured here is a contemporary new custom home: black shutters, roofing, and mulch, white vinyl siding, and brick steps with a bright red door. 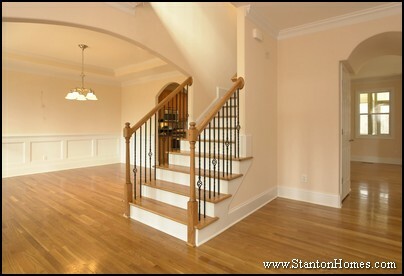 Transom windows surrounding the front door allow additional light into the foyer. A small front entraceway features stately columns. 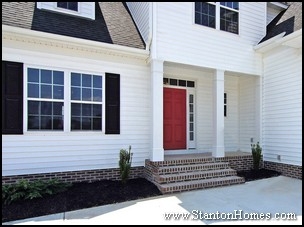 White accents and transom windows surround this red front door. Matching red shutters help draw out the color of this front door. The exterior of this home beautifully blends several tones of siding, including: dark grey shakes, light grey vinyl, and multi-toned stone. 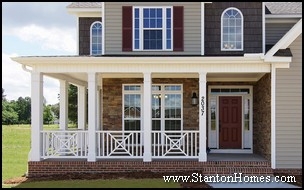 A covered corner wrap-around porch encases the front entrace with intricate railings. 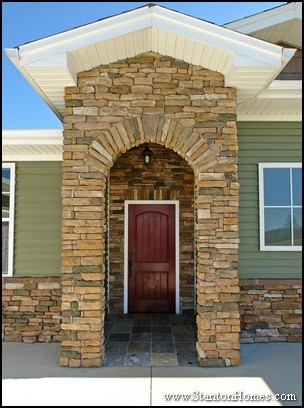 An arched stone covered entrace surrounds a solid red wood door. Light toned stone and vinyl exterior draw out the unique front door color and style. 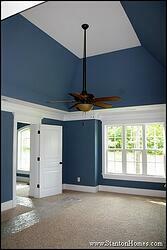 A custom tile floor leads into the home. No matter what style your new home is, it's easy to change the impact of the front of your home by adding a new coat of paint! 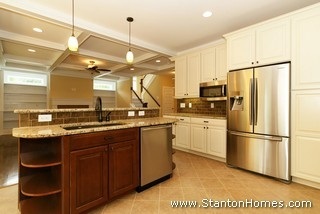 Want to read about new custom home trends? What are Homeowners Giving Up to Stay On Budget? Why Buy New instead of Used? 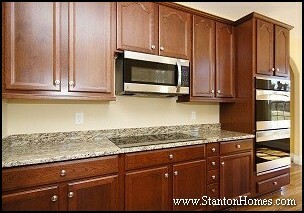 Stanton Homes can redesign your kitchen floor plan to put everything just where you need it – BEFORE you build. What’s cooking in the Kitchen? Here's our Kitchen Color Trend Forecast, courtesy of Andrea Enns. 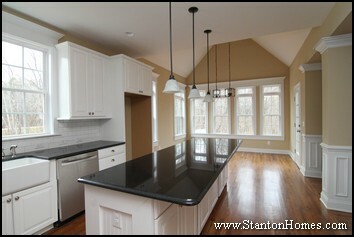 Ask Andrea your questions about custom home design trends! 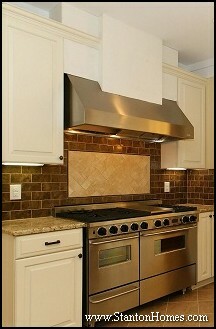 As the color gray continues to influence several design trends it will be prove to be a strong force in kitchen design. This is not a striking change but rather a strengthening of an already existing trend. 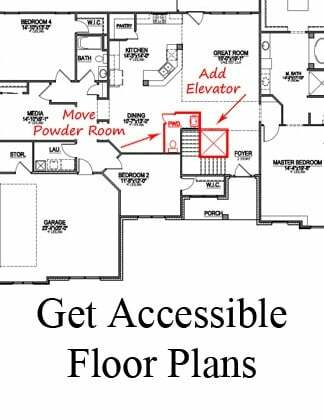 WALLS: We will see warm gray paints on walls such as Sherwin Williams 7641 Collonade Gray or Sherwin Williams 7647 Crushed Ice. 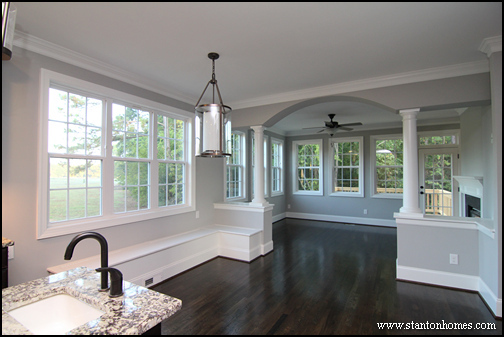 CABINETS: For cabinets gray is predicted to show up in a traditional way on painted Shaker style cabinets and in a more modern way in sleek high gloss finishes but either way, it will be paired with dark brown and white. Locally we are seeing warm gray neutrals such as those found in natural limestone and granite colors (Ambi White , Kashmir White, or River White) being paired with dark walnut cabinets or cherry or maple cabinets offered in Espresso or Chocolate finishes. 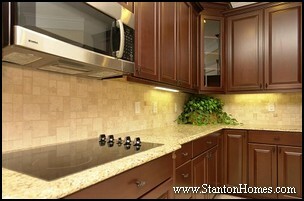 However, we are also seeing these warm grays beginning to be used with white or a combination of brown and white. This is great affirmation of the sustainability of traditional white cabinetry and good news for all of you white cabinet fans! Break up your white cabinets with an island of pickled oak or natural hickory cabinets -both light, neutral hues that lean towards light stone shades rather than anything golden. 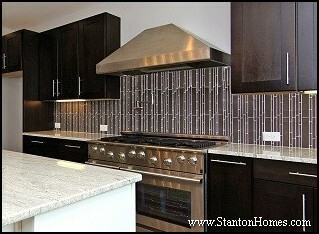 Add a honed Emperador mosaic stone backsplash or rich dark brown granite and warm gray walls. 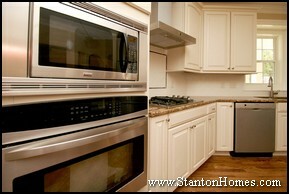 Fun accessories and small appliances will provide personality with pops of neon or jewel toned color. Although we have started to consider colors such as rich reds and blues for major appliances in our laundry rooms, it is not predicted that these will be popular appliance color choices in our kitchens. 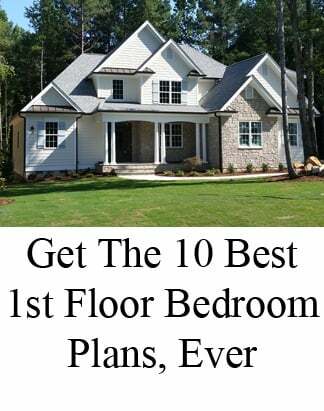 Since we are spending more and more time in our kitchens when we entertain in open floor plans, homebuyers are thus tending to assign more and more of our new home construction budget to the finishes and functionality of our kitchens. With that in mind, we naturally want our investment to last which is why bright colors are left for the smaller ticket items. 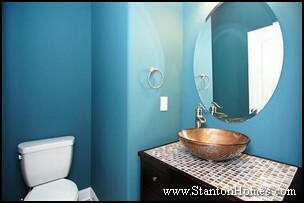 The accent colors are bold shades that remind us of exotic destinations. Look for shades of pink, orange, turquoise, and green. Look a little ways into the future and just picture how you’ll have it all together with the brightly colored mixing bowl set from the leading kitchen accessory retailer sitting on top of your new island of espresso brown shaker cabinets with an Ambi White granite top and how that bright colored print will look outstanding against your warm gray walls. 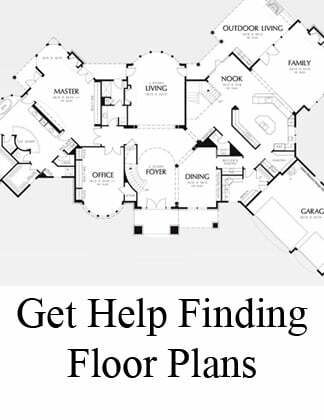 Do you have interior design questions? 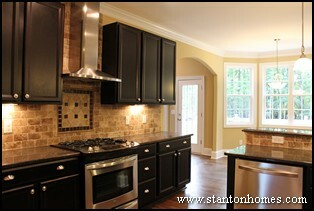 Want to know the hottest kitchen color design trends for your Raleigh new home? 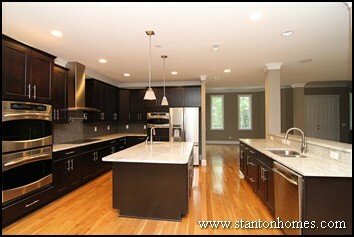 Get more Kitchen Color Trend ideas from these kitchen floor plan transformations, designed by Stanton Homes to fit the lifestyles of our homebuyers. Andrea Enns is an on staff design expert at Stanton Homes, offering professional design selection services to custom home clients as part of Stanton Homes' exclusive custom home packages. Andrea's extensive training includes the School of Architecture and Interior Design at the University of Manitoba and Red River College, a two year Design Internship in Vancouver, BC, under British Designer Jackie Yearsley, and years of experience with design and renovation. Andrea has worked with many of Raleigh’s top custom home builders, and contributed design work in many of the area’s finest Parade Homes.